*Not licensed in all states. A Message from the PHCC—National President: Legislative Conference 2018: Honoring American Freedom, Inspiring the Next Generation June. 12, 2018 By Laurie Crigler, L&D Associates, Aroda, Virginia The week before Memorial Day weekend, PHCC members descended upon Washington, D.C. to plead their case regarding several very important industry issues. It was appropriate that we were there that week because, not only did it gives us a chance to see our legislators and tell our story, but it gave us time to reflect about the importance of this holiday. Seeing D.C. all decked out in red, white and blue and setting up for concerts, speeches and Rolling Thunder gave us pause to think about the true meaning of Memorial Day – to honor those who have fought for us to keep our freedoms so that we can, in fact, come to tell our legislators what is important in our industry and how what they do affects our daily lives. Washington, D.C. is beautiful in any season but somehow was even more beautiful with the flags waving and wreaths being laid at Arlington National Cemetery. It was a traditional legislative event for PHCC. We arrived from all over the country, made appointments with our legislators and their staffs, told our stories and returned triumphantly (sometimes) to feel rejuvenated that those who create the laws by which we live heard us loud and clear. Where Do We Go From Here? We discussed the workforce shortage and the necessary funding to help with that effort. We discussed the Water Infrastructure Funding Initiative Act (WIFIA) and how important this act will be to help fund the needed water infrastructure repairs across the country and provide jobs. We discussed putting the trades back in the high schools to help the skills gap that exists. Most legislators, across the board, could hardly argue with these efforts. To that point, I have declared the conference a success … but our job is not done. We now must connect with those same legislators back home, get to be their friends, and constantly remind them of how important these issues are to the health of our country. The Next Generation Speaks Up One of the most satisfying things that happened during that week was that several of our members thought it important enough to bring their children and grandchildren to this event. I was thrilled that we had as many as six young teens (ages 11-15) with us, traipsing all over on Capitol Hill and sharing with key decision-makers how those issues will affect them in the future … a very powerful message to our legislators. And those teens became part of our PHCC family … I hope for a very long time. It was great to hear them relate their experiences up on Capitol Hill and gave even this old, jaded PHCC-er a new lease on life. It was exciting to hear them talk freely (as if they had been part of us for a very long time), and it was even more exciting to hear that at least one wanted to apply to be an intern in a congressional office and one wanted to apply to be a congressional page. How refreshing! There is hope, folks … and these young people gave me back mine. It is comforting to know that there is another generation behind us that understands what our issues are and how to begin moving the log-jam that we have felt for so many years. If you did not come to the 2018 PHCC Legislative Conference, please make an effort to come next year. We grow in numbers every year, and thus in strength ... and now we have our youth on our side as well. Maybe one year, we will be pleading our case to one of those young persons, who grows up to be the legislator we go to visit. One can only hope! 603.1 General. Cross-connection control shall be provided in accordance with the provisions of this chapter. No person shall install a water-operated equipment or mechanism, or use a water-treating chemical or substance, where it is found that such equipment, mechanism, chemical, or substance causes pollution or contamination of the domestic water supply. Such equipment or mechanism shall be permitted where equipped with an approved backflow prevention device or assembly. The prevention of cross-connections is a primary responsibility of the plumber, maintenance or service worker. A thorough knowledge of backflow prevention and installation and testing of backflow prevention devices is needed to ensure the protection of the water system. 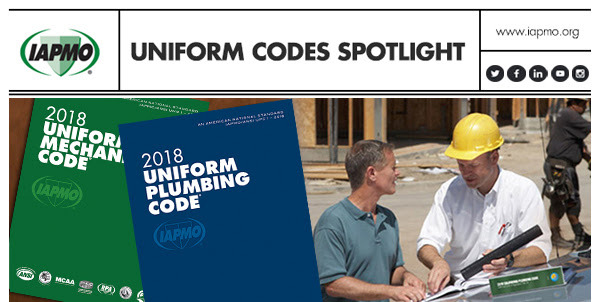 IAPMO's Backflow Reference Manual contains comprehensive information on installation, testing, cross-connection control, repair, and inspections. Cross-connection means any actual or potential connection or structural arrangement between a public or private potable water system and any other source or system through which it is possible to introduce into any part of the potable system any used water, industrial fluid, gas or substance other than the intended potable water with which the system is supplied. Bypass arrangements, jumper connections, removable sections, swivel or changeover devices and other temporary devices through which backflow can occur are considered to be potential unintended cross-connections. There are two types of cross-connections – direct and indirect cross-connections. There are two types of backflow caused by these cross-connections – backsiphonage and backpressure backflow – and there are two types of backflow conditions – pollution (low hazard) or contamination (high hazard). Polluted water may have an undesirable taste, color, or odor, but it is not considered unfit for human consumption and will not cause sickness. Contaminated water is water that is not safe for human consumption and will cause sickness or even death. Contaminated water is always considered to be nonpotable and requires a more absolute method or device to prevent backflow. It must be understood that a device or method that is suitable for only isolating potable water from a potential pollutant may be unacceptable as a means of protection against contamination. For example, a double check valve backflow assembly will be acceptable for a pollutant (low hazard) but not for a contaminant (high hazard). For a cross-connection to occur, a link or channel between a polluted water source and pipes carrying potable water must exist. 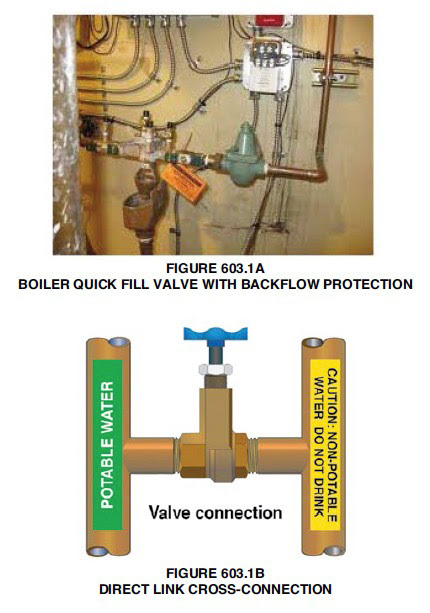 Two factors are essential for backflow to occur in a cross-connection. First, there must be a link between the two systems; this consists of either a physical connection or an arrangement or situation where backflow can occur. Second, an unbalanced force of liquid pressure must act toward the potable water supply. In a direct cross-connection there must be a direct physical connection existing between the potable and nonpotable system. An increase in pressure must also exist on the downstream side of this connection causing a reversal of flow from the original intended direction of flow. Backflow occurs when the pressure within a polluted system exceeds the pressure in the potable water system. This is a backpressure cross-connection. A typical example of this type of cross-connection is the quickfill line for a boiler. The treated water in the boiler and connected piping represent the hazard, in this case a high hazard. This is because the pump circulating the fluid in the piping system could cause an increase of pressure above the quickfill line supply pressure and cause a backflow of treated water into the potable supply. Therefore, Section 603.5.10 requires a reduced pressure principle backflow prevention assembly where chemicals are introduced into the system (see Figure 603.1a). The other type of cross-connection is an indirect crossconnection. There are two types of indirect cross-connections – under-rim or submerged connections, and over-rim connections. The under-rim or submerged cross-connection is where the water inlet comes into the bottom or side of a receptacle and is immersed in a polluted or contaminated substance (see D in Figure 603.1c). Without some form of protection just the filling of the lavatory to its rim could cause backflow into the potable water supply. An over-rim connection is one where the water supply terminates above the flood level rim of a fixture but has a hose fitting or connection that creates a potential for an under-rim termination (see A, B and F in Figure 603.1c). In this instance, the over-rim supply line may not be continuously submerged unless a hose is permanently attached. Backflow may occur if the hose is left in the sink and something happens to cause a negative or lower pressure in the fixture supply, such as a break in the line or draining the system while leaving the fixture valve on. This will cause a siphon to occur drawing the possibly contaminated water into the potable water supply. The type of backflow that occurs in these instances is backsiphonage. See Figure 603.1cfor other examples of backsiphonage. The control of backflow requires removal of one of the two essential factors that can cause the backflow; namely, the physical link or the cause of the negative or low pressure. Removal of the physical link or cross-connection, such as in Figure 603.1b is a positive means of preventing backflow and is the only true means of preventing bacterial contamination. This can also be accomplished with a backflow prevention device or an air gap as specified in the following sections. The appropriate selection, installation and testing of the devices are functions essential to the process of isolating pollutants and contaminants from the potable water system. There are two basic areas where backflow protection is required. The first is the protection of the public or private water supply. The water purveyor may require all connections to the public water supply to have some form of protection. In some areas this may mean that every water service to a public, private or residential building may require a backflow prevention device to protect the system. This is called containment protection. The public water supply is contained and protected from contamination. The other area of protection is inside or outside the building downstream of the containment protection. There may be connections to equipment or systems that could contaminate the building water supply. Backflow protection is required at this connection. This is called isolation protection. The contaminated fluid is isolated downstream of the connection to the building water supply. An atmospheric vacuum breaker on a urinal is a case of isolation protection. If you have questions or comments, join the discussion on our LinkedIn forum. 715.3 Existing Sewers. Replacement of existing building sewer and building storm sewers using cured-in-place pipe lining trenchless methodology and materials shall be installed in accordance with ASTM F1216. Cast iron soil pipes and fittings shall not be repaired or replaced by using this method aboveground or belowground. Replacement using cured-in-place pipe liners shall not be used on collapsed piping or when the existing piping is compromised. to a point where the installation of the liners will not eliminate hazardous or insanitary conditions. The proposed amendment adds, "cured-in-place pipe lining" to the first sentence to clarify the type of trenchless methodology that is allowed under this code. The proposed amendment also adds, "Replacement using cured-in-place pipe liners shall not be used on collapsed piping or when the existing piping is compromised to a point where the installation of the liners will not eliminate hazardous or insanitary conditions." The new sentence clarifies that conditions where the existing sewers are significantly damaged to the point that the lining will not provide sufficient remedy are not appropriate for using cured-in-place lining technology. It is reasonable to clearly prohibit the use of cured-in-place pipe lining when the existing sewers are substantially damaged to prevent insanitary conditions. Trenchless methodologies have been in use in the United States since early 2000. Trenchless methodologies for replacing existing sewers do not require continuous open trenches, but rather utilizes subsurface techniques such as tunneling, directional boring, pipe bursting (see Figure A), and cured‐in‐place pipe (Figure B). Cured-in-place pipe rehabilitation (CIPP) involves a linear insertion of a resin‐saturated liner into the host pipe. The liner is either pulled or inverted through the host pipe. When inverted, the liner is turned inside‐out as air is forced into one end of the liner. After the resin liner expands to the inside dimensions of the pipe, a curing process using heated water or steam polymerizes the resin liner to form a pipe within a pipe. ASTM F1216 provides a more detailed explanation of the CIPP procedures. This standard applies specifically to the installation of a resin‐impregnated, flexible tube that is cured in place of the pipe. It does not apply to a pipe bursting technique. The standard provides installation requirements and inspection practices. Inspection requirements include cut samples for flexural and tensile testing, leakage testing, pressure pipe testing, delamination test, wall thickness, and a visual or closed‐circuit television inspection. Trenchless methodology in accordance with ASTM F1216 is not allowed where the pipe is collapsed or compromised. This means that the cross‐sectional area of the pipe is more than 40 percent obstructed preventing the insertion of the resin‐impregnated tube. Piping of cast iron material is not permitted to be repaired by this method because it conflicts with the manufacturer’s product standards. 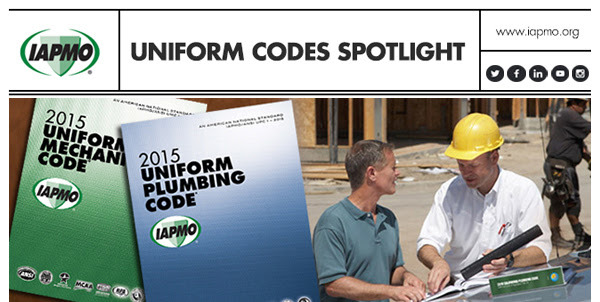 This email is not to be considered the official position of IAPMO, nor is it an official interpretation of the Codes. © 2018 International Association of Plumbing and Mechanical Officials. The secondary roof drains shall connect to the vertical piping of the primary storm drainage conductor downstream of the last horizontal offset located below the roof. The primary storm drainage system shall connect to the building storm water that connects to an underground public storm sewer. The combined secondary and primary roof drain systems shall be sized in accordance with Section 1103.0 based on double the rainfall rate for the local area. 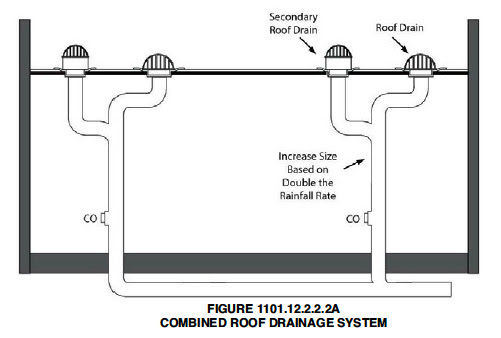 The secondary roof drain piping can be installed using the method in either Section 1101.12.2.2.1 or Section 1101.12.2.2.2. The secondary piping may be an entirely independent system consisting of roof drains, conduits and leaders, which independently discharge to the outside of the building. This secondary system is a mirror of the primary system, sized and piped identical to the primary system. If this method is used, the primary drainage piping must be piped to the curb, gutter or other approved area. The secondary system, basically an emergency overflow system, can be piped to an open area even if it is a walkway or other traveled outside area. The reason for this is that the secondary system should seldom be used, and if it is used, it would give a warning that something is wrong with the primary system. This secondary piped system gives the owner of the building the largest margin of safety for the building and its occupants. The other method of secondary roof drainage piping is to connect the secondary roof drains to the piping serving the primary roof drains (see Figures 1101.12.2.2.2a, 1101.12.2.2.2b and 1101.12.2.2.2c). 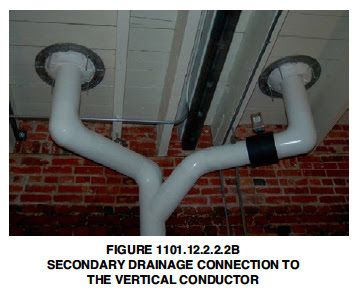 The connection of the secondary drain must be in a vertical section of piping downstream of any horizontal piping below the roof. 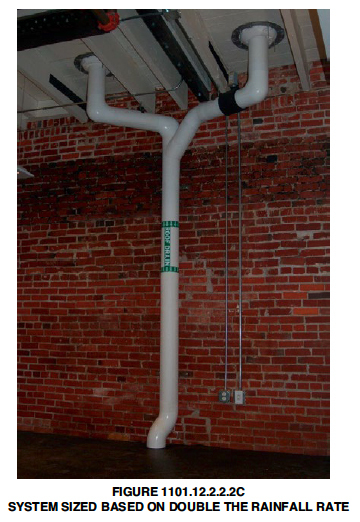 If this method is used the size of the conduits, leaders and downspouts downstream of the connection must be increased by using twice the rainfall rate required for the primary piping. For example, if the rainfall rate for the area is 3 inches per hour the size of the combined piping system must be calculated using 6 inches of rainfall per hour. To view this in your browser click here. This section provides an overall performance requirement for a natural draft vent system. The vent system must remove all the products of combustion from gas appliances from a building. The principle on which natural draft vents operate is simple. 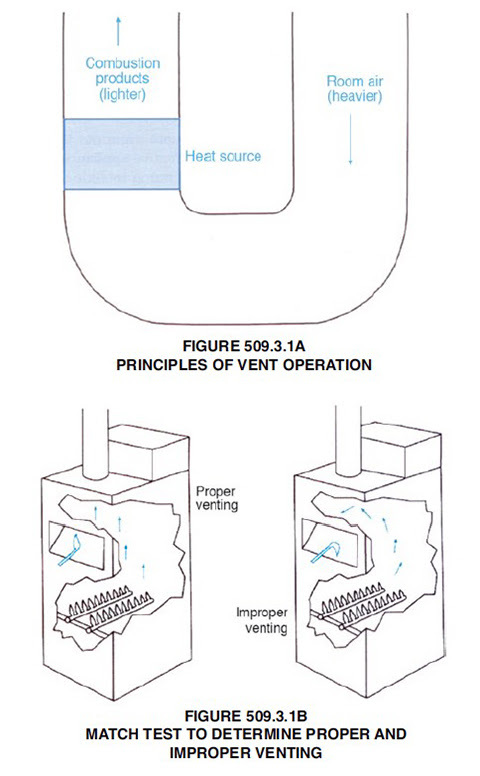 Reduced to fundamentals, heat is the power that operates a natural draft vent or chimney, as shown in Figure 509.3.1a. Combustion gases rise in the chimney or vent only because they are hotter and, therefore, lighter, than the surrounding air. The hotter the gases and the higher the vent, the more swiftly and powerfully the gases will rise. Conversely, the cooler the gases and the shorter the vent, the more sluggish the gases' movement will be. The flue gases in the vent must remain hot enough over the length of the vent to provide a strong draft. If cooled enough, the upward motion of the gases stops altogether and combustion gases can spill into the building through the relief opening of the appliance draft hood. When the combustion products and dilution air rise in the vent, this volume must be replaced by air from outside the building. This replacement air can be supplied through normal air infiltration (through small openings in the building walls), through outdoor openings purposely installed in outside walls or by a mechanical air system. Thus, to ensure proper vent operation, the building's air tightness and other devices exhausting air from the building must be taken into account. Fan-assisted combustion appliances cause some confusion because they are listed as Category I appliances, meaning that their vents operate by natural draft due to the heat of the vent gas. However, these appliances have a fan to assist the flow of the combustion product through the appliance. The fan is necessary because modern, higher-efficiency appliances have a higher pressure drop through their heat exchangers. The pressure provided by the induced draft blower is matched carefully to the resistance of the heat exchanger. Once the combustion products exit the appliance, the natural buoyancy takes over in the vent. If the vent is designed using the tables of Section 510.0, the pressure in the vent system will be negative. Some furnaces are listed as Category I or III appliances, depending on the method used to vent the appliance. The fan in these furnaces is sized to result in negative vent pressure when connected to a properly sized vertical vent (Category I) or in a positive vent pressure when vented horizontally (Category III). Category III installation requires using venting materials recommended by the manufacturer's installation instructions. Operate the appliance for at least 5 minutes to allow the flue gases to heat the vent. Move a lighted match across the entire width of the draft hood relief opening (see Figure 509.3.1b). If the match flame is blown downward or extinguished, have the venting system or chimney checked by a qualified agency. If the appliance is not equipped with a draft hood, the match test may not be applicable. In this case, the plumber should consult the appliance instruction manual. Good air circulation in adequate amounts is also vital for good venting and effective appliance operation. Signs of improper operation include a yellow or wavering flame, discoloration around access doors, a pungent odor in the building, excessive humidity, condensation or mold, corrosion of the vent material and soot near the burner or vent area. 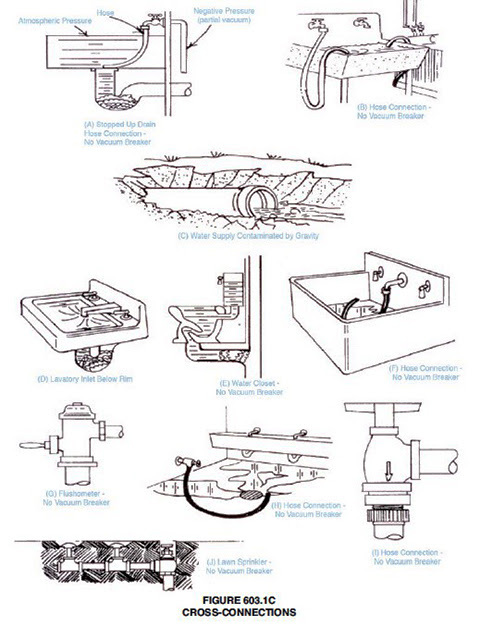 If any of these conditions are observed, a qualified agency should be contacted to have the installation inspected. Under extremely adverse conditions, carbon monoxide can be produced as a result of either improper venting of combustion products, insufficient fresh air to support the proper burning of gas, or improperly adjusted appliances. If symptoms of carbon monoxide poisoning are experienced — headache, yawning, ringing in ears, weariness, vomiting, heart fluttering or throbbing — fresh air is needed promptly. Open windows or go outdoors. Any gas appliance suspected of operating improperly should be shut off and immediately checked by a qualified agency. 1009.0 Interceptors (Clarifiers) and Separators. 1009.1 Where Required. Interceptors (clarifiers) (including grease, oil, sand, solid interceptors, etc.) shall be required by the Authority Having Jurisdiction where they are necessary for the proper handling of liquid wastes containing grease, flammable wastes, sand, solids, acid or alkaline substances, or other ingredients harmful to the building drainage system, the public or private sewer, or to public or private sewage disposal. Interceptors and separators serve a different purpose than fixture traps in that they protect the drainage and sewer systems from the introduction of substances that might be harmful to those systems. 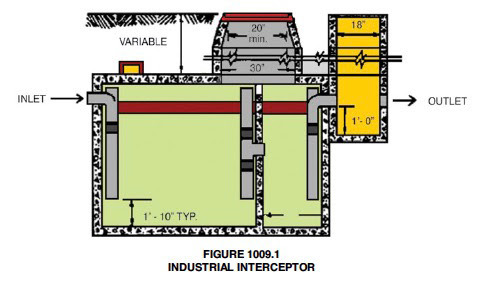 An interceptor or separator is a device designed and installed to separate, retain and treat deleterious, hazardous and undesirable matter before they enter the sewer system (see Figure 1009.1). Normal sewage or liquid wastes bypass these devices and discharge into the sewer system via the building drain and sewer. If large amounts of grease, soaps and oils enter a sewer system, the materials will coagulate, solidify and adhere to the inside wall of the pipe, eventually blocking or partially blocking the pipe. Similarly, solids such as sand, plaster, metal chips and stones will cause stoppages or partial stoppages if permitted to enter the system. Oils, kerosene, gasoline, naphtha and paraffin present the danger of fire and explosion in sewer piping. Acids, alkalis and other chemical wastes in concentrated amounts could attack the piping through corrosion. In addition, all of the above are detrimental to proper functioning of sewage treatment plants, both public and private, and must be collected and treated before they discharge to the sewer system. 1. Floatation. Gasoline, oil, grease and other volatile liquids are lighter than water and are not readily soluble in water. They tend to separate out of the liquid waste and float to the top of the container where they can then be collected and removed. Hydromechanical grease interceptors, gravity grease interceptors and oil or gas interceptors are examples of devices that use floatation as a primary method of separation. 2. Sedimentation. Sand and other solids, which are heavier than water and also are not soluble in water, tend to settle out of the waste water to the bottom of the container. The solids can then be pumped or vacuumed out of the interceptor. Sand interceptors, septic tanks and drum traps for smaller installations are examples of devices that use sedimentation as the primary method of separation. 3. Neutralization. Chemical wastes that could be detrimental to the sewage system in concentrated amounts must be neutralized before entering the sewer system. Chemical waste is collected before entry into the sewer and treated or neutralized before being discharged to the sewer. Acid neutralizing tanks and other such devices are examples of systems that use neutralization as the primary method of separation. Occasionally, waste with high concentrations of grease or emulsified grease may require further treatment, such as additional settling, rock filtration and chemical or mechanical treatment to remove the grease. There are many instances where one of the three methods or a combination of methods for treating these wastes is needed. Examples of the use of these devices are: restaurants, hotels, cafeterias, schools, hospitals and institutional or commercial buildings where food is served in great quantity may produce grease in sufficient amounts to warrant the installation of grease interceptors; dairies, slaughterhouses and commercial food-processing plants have grease and fats as byproducts and require interceptors; gasoline service stations, garages, automobile repair shops, laundries, drycleaning plants, machine shops and industries using chemical processing are sources of flammable and volatile wastes that must be removed and treated; machine shops, garages, service stations, hospitals, medical clinics, dental laboratories and fish preparation areas contribute solids such as metals, plaster, sand and fish scales; hair and lint interceptors may be necessary in beauty salons, barbershops, surgical preparation rooms and veterinary facilities; and dental laboratories and jewelry manufacturers may require interceptors for the recovery of precious metals. Separators and interceptors will be designed by the manufacturer and the installation location designated by a plumbing engineer or design professional. The plumber's or plumbing contractor's responsibility is to install the system properly. In addition to the manufacturer's installation instructions, the following sections provide guidance for the installation of the interceptor or separator.